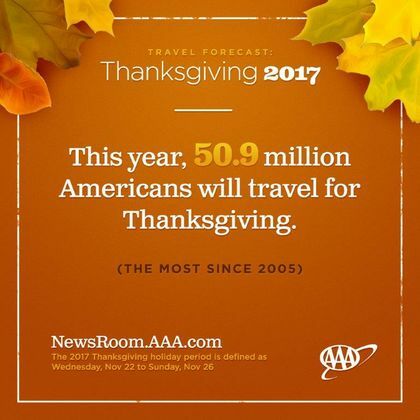 AAA projects 50.9 million Americans will journey 50 miles or more away from home this Thanksgiving, a 3.3 percent increase over last year. The 2017 holiday weekend will see the highest Thanksgiving travel volume since 2005 with 1.6 million more people taking to the nation’s roads, skies, rails and waterways compared with last year. Thanksgiving holiday travelers will total 8.65 million, an increase of 3.3% from the 8.37 million in 2016. 7.7 million will travel by automobile, up 3.1% from last year’s number of 7.5 million. 672,000 people will fly to their destinations, up 5.8% from the previous year’s amount of 635,00. While AAA expects most U.S. drivers will pay the highest Thanksgiving gas prices since 2014, the vast majority of holiday travelers (89.3 percent) are still planning to hit the road. Automobile travel will grow by 3.2 percent this Thanksgiving, with 45.5 million Americans planning a holiday road trip. Despite recent declines in the national average price for gasoline, the residual impact of recent months’ hurricanes linger. Today’s national average price is $2.562, which is 41 cents more than last year. Travelers will pay more for AAA Three Diamond Rated hotels this holiday weekend. The average price increased by 14 percent to $176/night. Conversely, the average rate for a AAA Two Diamond Rated hotel has decreased 5 percent with an average nightly cost of $117. Daily car rentals rates will average $70, 34 percent higher than last Thanksgiving. AAA expects to rescue more than 330,000 motorists across the country this Thanksgiving weekend, with the primary reasons being lockouts, flat tires and battery-related issues. AAA recommends motorists have their vehicles inspected by a trusted repair shop, such as one of the more than 7,000 AAA Approved Auto Repair facilities across North America. Members can download the AAA Mobile app, visit AAA.com or call 1-800-AAA-HELP to request roadside assistance.